I'm fully aware that cabbage and pork mince baked in the oven might seem quite odd, but why not give it a go? It may also seem a bit odd to not fry off the mince first but it works just fine to bake it. If you're familiar with my Swedish dishes you'll probably recognise the basics - meat and potato. That's the basis of quite a lot of the Swedish cuisine and to be honest - I can't find much wrong with that. I'm not a food historian but I have half an idea that this dish might have its origin in the Turkish dolme. At one stage back in the 1700's a Swedish king got stuck in Turkey for a year or so. When he finally left for Sweden again, he and his army brought some Turkish cuisine with them. Over the years these dishes have been assimilated into the Swedish culture and quite a lot of people have no idea where they originated from. See, a bit of a history lesson - this blog can surprise you every now and then. In a positive way at times too. 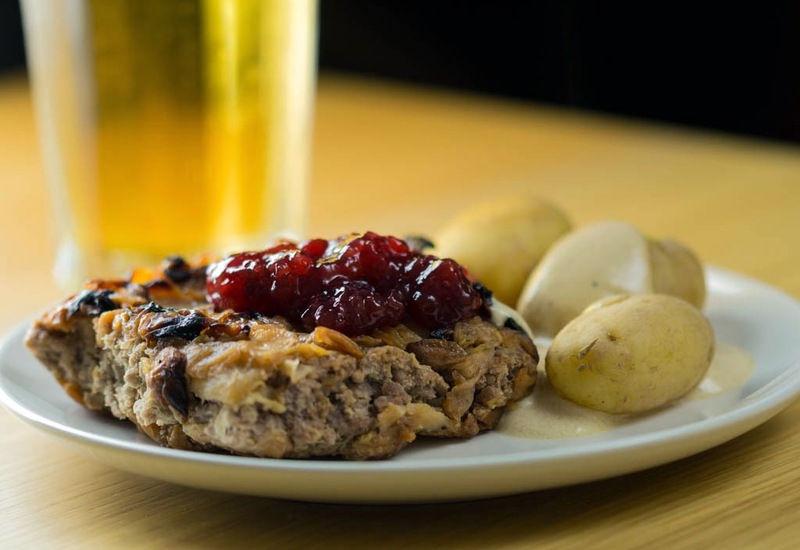 As you can see from the picture the traditional way of serving this is with boiled potatoes, cream sauce and lingonberry jam. A dish at least my generation very much would consider a classic school lunch but it works just as well for dinner. Some people, including myself on occasion, mix in about 150 ml cooked rice with the mince when they cook this. It pads it out a bit and makes it even more filling. Try both ways, you might find that you prefer one more than the other. The cabbages I used the day I cooked what you can see in the picture above must have been more water than cabbage. Normally you'd expect to have more height, or volume provided by the cabbage, in the bake - I guess it just wanted to screw up my photo. Quarter and core the cabbage. Slice and dice the cabbage into 1 - 2 cm squares. Heat the butter in a frying pan and brown the cabbage, preferably in smaller batches. Once all the cabbage is browned return it to the frying pan together with the diced yellow onion, Golden Syrup, water, salt and pepper. Let this cook together until the water has evaporated. In the meantime season the mince and mix with the egg. Put half the cooked cabbage in a ovensafe dish, spread out the mince mixture and top with the second half of cabbage. Cook in the oven for about 45 minutes or until nicely browned and cooked through. If the top layer of cabbage picks up colour too quickly and looks like it will turn into cremated matter - cover it with tinfoil for the rest of the cooking time. Serve with boiled potatoes, cream sauce and lingonberry jam. Mike, I would probably like it, being a huge fan of cabbage. Just posted my coleslaw and recently posted stuffed cabbage rolls. And potatoes always make me happy! Your slaw looks good. I'm also one for less mayo in the dressing. Sadly I couldn't find your stuffed cabbage rolls, but they sound a bit like the dolme I mention above.